Anyone who browses through my recipes category will see that I am a big chicken fan. I always have loved all cuts of a chicken and cook it several times a week, so I am always on the look out for new ways to prepare it. 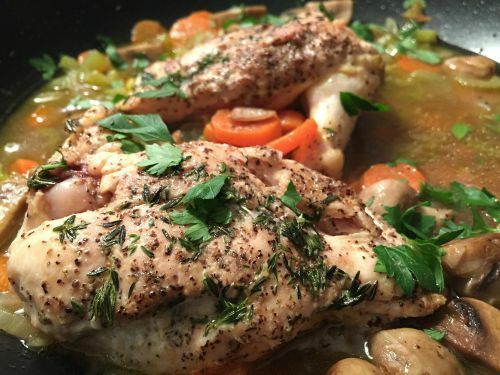 But every once in a while, along the way, my chicken ended up drier than I would have liked, so I thought it would be a good thing to share some of the cooking tips that I have learned for cooking chicken for the best results. Follow these Tips for Cooking Chicken for Moist Results Every Time. Some of these tips relate to how to cook chicken properly. 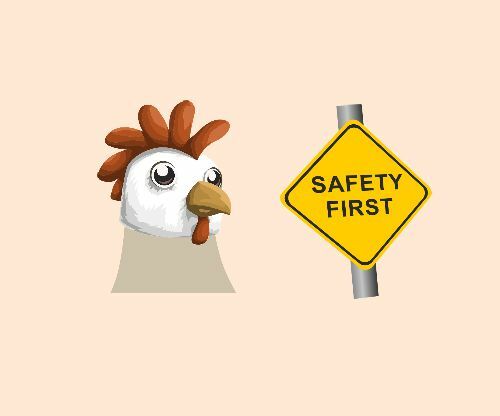 Some talk about safety aspects of chicken which also help to keep chickens moist. 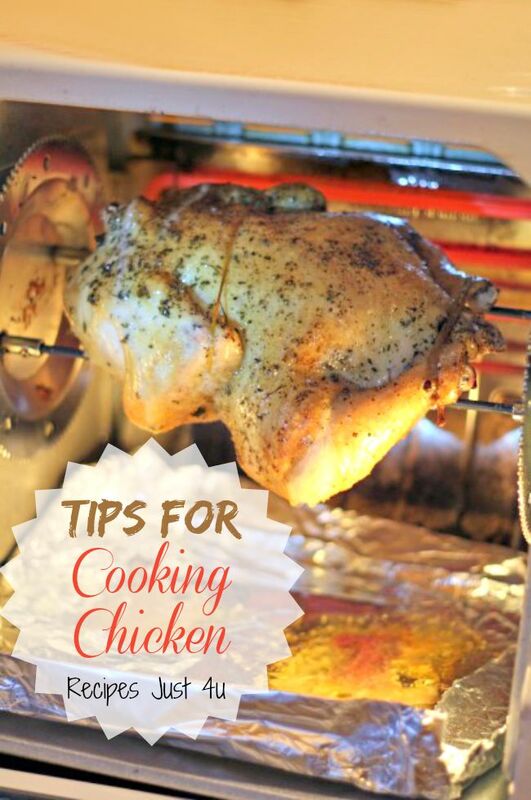 All of the tips will help to make sure that your next chicken recipe is moist and delicious. There is no point in putting a boneless, skinless chicken breast directly on a charcoal grill. 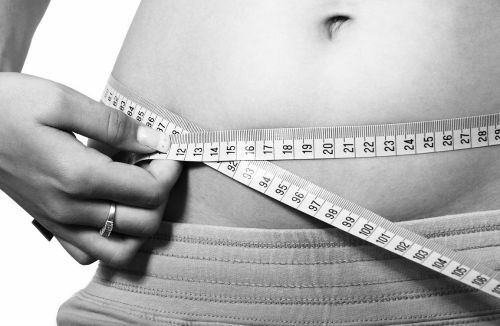 All of the fat has been removed and you will end up with a piece of shoe leather. Each cut has a way that gives the most moist results. Hands down, roasting is my favorite way to cook a whole chicken. Even then, it’s not just a matter of plopping it in the oven and letting it cook. 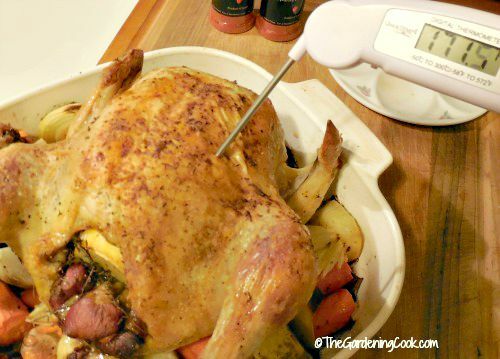 See my tips for a perfect roast chicken here. Fresh herbs, lemon and a few tricks go a long way to helping this bird stay moist. I use chicken breasts all the time for stove top dishes where a sauce is used. This helps to make sure that the chicken stays moist with a short cooking time, and the sauce adds a lot of extra flavor to the dish. Chicken breasts, especially with the skin still on, are great for deep frying too as well as oven baking. Basically, you want a short cooking time for chicken breasts in all forms of cooking. Chicken thighs and legs are considered “dark meat” and are from the juicier part of the bird. They have more fat content (even the skinless ones) and can be cooked on the stove top, in a deep frying, on the grill and in the oven. 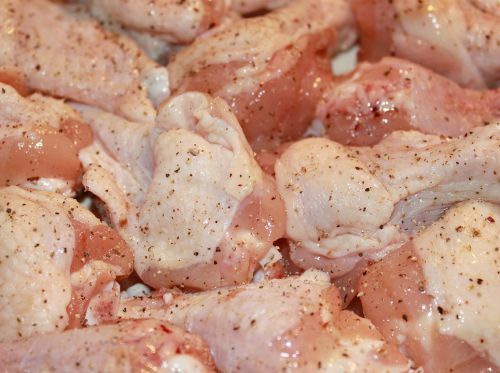 There are factors that will contribute to dry chicken, so be sure to see if you are doing these things correctly. Most chicken has been frozen at some point, but freezing it again can result in moisture loss, which means meat that is less tender. If you leave the chicken unwrapped in the fridge, it will dry out and become tough when cooked. Wrap it tightly with cling wrap to preserve moisture. I know that boneless, skinless breasts are all the rage, but the are also the easiest cut to end up dry. For best result, leave the skin on the chicken. You can remove it before eating to save some of the calories from the fat. I cooked these at a low speed in the microwave and will cook them later on the grill. When you roast a whole chicken, cover the breast part of the bird with aluminum foil during the first part of the cooking time. You can remove it in the last 30 minutes to allow the chicken to brown. Most chicken likes medium heat and moderate oven temperatures. If you put a bird in the oven and try to cook it in one hour at 450º instead of 2 hours at 350º, don’t be surprised if your chicken is really dry. 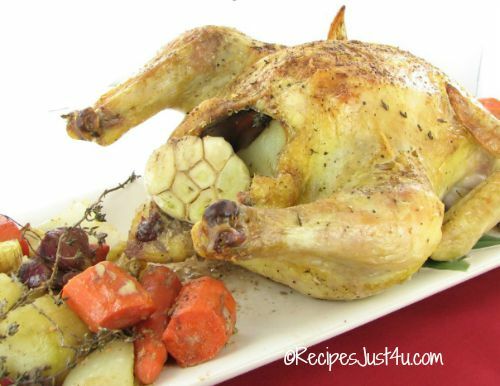 When you are done cooking, let your chicken rest for 10-15 minutes before serving, especially with a roast chicken. This allows the juices to be evenly distributed through the whole chicken. Turning it over while resting also allows the juices to reach the breast area, in the case of a whole chicken. Just as with any meat, how you slice the chicken makes a difference. Cut across the grain, since this produces shorter fibers, resulting in a more tender piece of chicken. 3. To Keep the Calories down. There are a few tips that will help when you are counting calories without sacrificing the flavor. A lot of the calories in chicken comes from the skin layer. Cook with the skin on but remove it before eating to save fat and calories. Cook on a rack when you roast to allow the fat to drip away and this saves lots of extra calories. The meat will still taste great. I use fresh herbs all the time in my recipes. They have minimal calories and add lots of flavor to any recipe. Use herbs, spices and fat free broth for flavoring instead of higher fat ingredients such as cheese and cream. A cup of fat free broth has less than 20 calories and a cup of cream has over 800. Do the math! 2% milk can often be switched out for cream to save a lot of calories but still give a creamy finish to sauces. For soup making, let the broth cool and remove the layer of fat that forms before finishing the soup. Use a non stick skillet for the stove top. This will allow you to add less extra fat to cook the chicken. These tips will help to make sure that your bird is moist every time. When cooking several cuts of chicken, remove those that cook more quickly and keep them warm to avoid overcooking some but not others. How much does a chicken yield? One pound of boneless chicken is approximately 3 cups of cut up chicken. Trussing a chicken adds to the cooking time. Un-trussed chickens also cook more evenly. It takes longer to cook a covered chicken in the oven than an uncovered one. Use a meat thermometer to test doneness. You can also wiggle the leg around on a whole bird. It should move freely at the joint area. If the chicken is still pink inside, it is NOT done. Don’t over crowd the pan. This rule goes for cooking almost everything and chicken is no exception. If you leave space around the pieces, they will brown better and cook more evenly. When marinading, save some marinade for later. 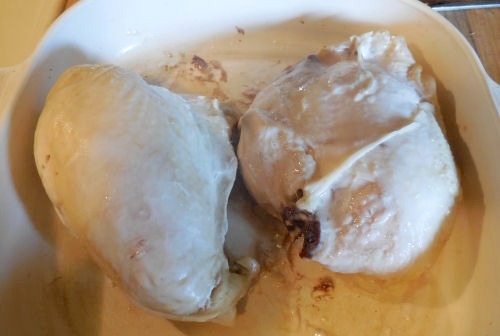 It is not safe to reuse a marinade that has had raw chicken (or any meat) in it. Stuffing a chicken adds to the chicken time, but gives the chicken additional flavor. Before you cook the chicken, there are several things to remember. Keep chicken in the fridge, not on the counter top at room temperature. Chicken will keep in the fridge in the original wrapping for 2 days in the coldest part of the fridge. While it is better to use it within two days of purchase, properly packaged chicken will maintain its quality in a freezer for up to a year. If it has freezer burn, discard it. The moisture is gone and the chicken will be dry. Thaw chicken in the fridge, not on a counter top. It takes about 2 hours to thaw a 4 pound chicken in the fridge. A microwave is also a safe way to thaw frozen chicken. I use power setting of 1 to do this. Be sure to wash hands after handling raw chicken, as well as the cutting boards, knives and other utensils. It’s good to have a designated cutting board for meat instead of using the same one that you prepare other foods on. 6. Ways to cook chicken. Chicken is such a versatile bird. It can be cooked in so many different ways. This is best when you have a whole bird that you want to cook. It can be done in any oven, both normal and convection and gives juicy, moist results every time. If you have an oven that has a rotisserie grill, or a stand alone rotisserie cooker, it cooks whole chickens beautifully and browns well. 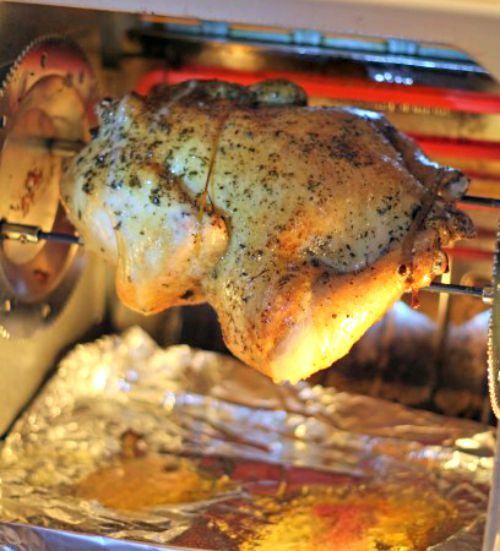 Since the chicken rotates while cooking, this type of technique gives you a crispy and delicious outside skin layer. Baking is similar to roasting but is used for chicken pieces. It is very good for dark meats of chicken, or casseroles with white meat that will cook quickly. All chicken can be cooked this way. If you use white meat, leave the skin on for the best results. 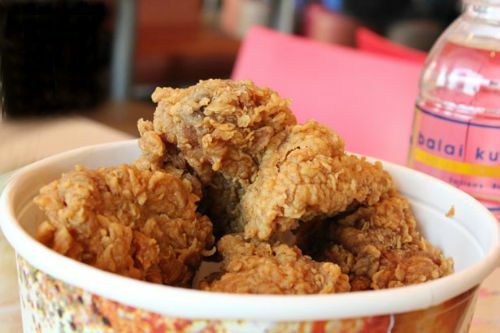 Deep fried chicken has more calories since the oil cooks onto the chicken and coatings are often used. I often precook chicken that I plan to grill in the microwave on power 2 or 3 and then cook it on the grill. This keeps it moist. See my tips for cooking perfect BBQ chicken. This can dry out a piece of chicken so dark meat works best. Place on a broiler pan a few inches from the heat source. If you microwave on a slow setting and first and just brown under the grill, the chicken will dry out less. This type of cooking method uses additional oil in a hot skillet to brown quickly. For white meat, I reduce heat after browned to make sure it does not dry out the chicken. Slow cookers are great for most cuts of chicken. Breasts will dry out if you leave the cooker on too long though. Adding extra sauce that is added to a slow cooker makes for moist chicken though. If you enjoy using a slow cooker, check out these tips for best results. Most cuts of chicken turn out very well in any soup recipe. One of my favorite recipes is my mom’s chicken stew. Basically a soup with dumplings and such a comfort food meal! 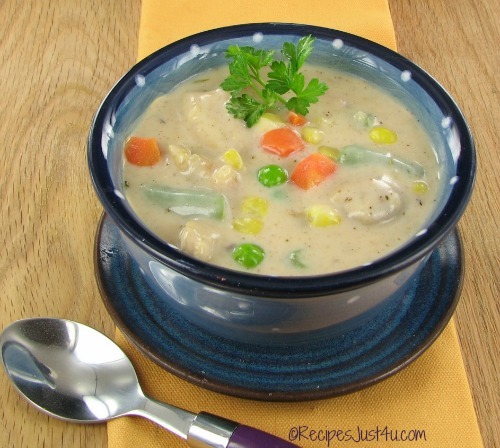 This chicken pot pie soup is also a favorite of mine. 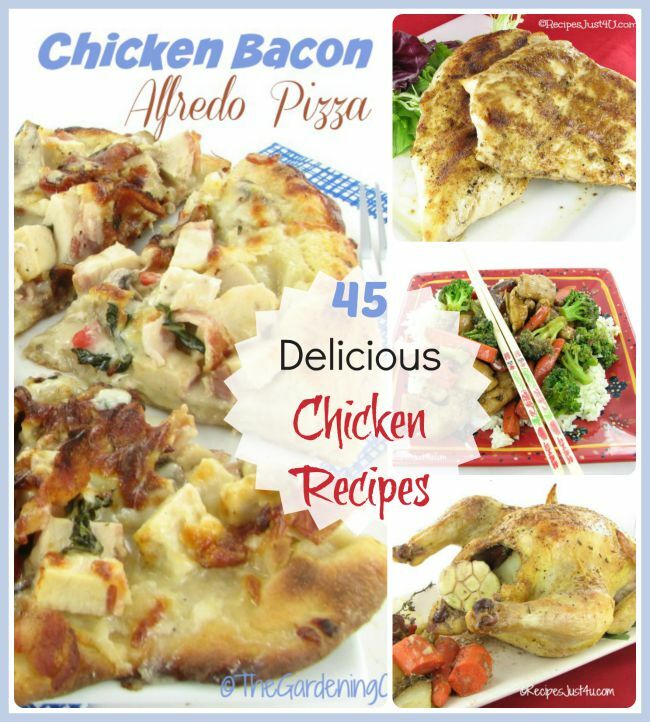 Now that you have some tips for cooking chicken, it is time for the recipes! Perhaps one of these will be perfect for your meal time tonight. 1. Shiitake Mushrooms and Wild Rice Soup. 2. 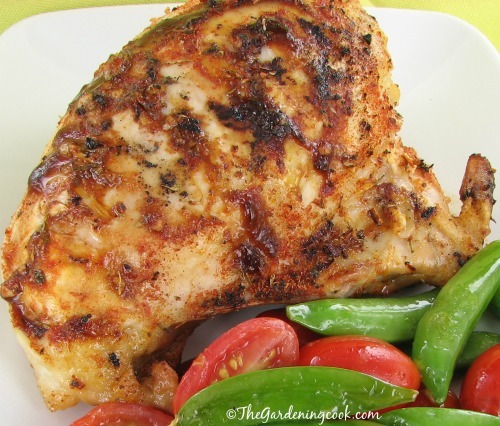 Cumin Grilled Chicken Breasts. 3. Chicken and Red Potatoes. 7. Simple Creamy Chicken Enchiladas. 9. Savory Chicken Tikka Masala Curry. 10. 30 Minute Chicken and Dumplings. 11. 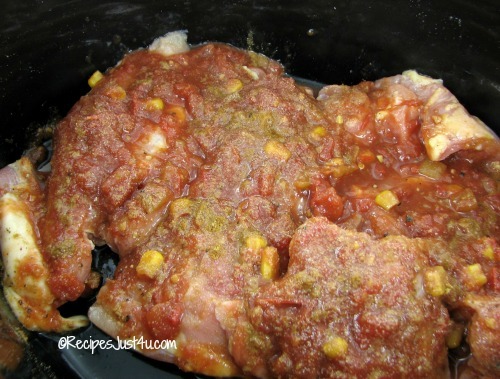 Tasty Slow Cooker Chicken a La King. 12. Layered Taco Chicken Salad. 13. Pesto Chicken Penne Casserole. 14. Spicy Mexican Chicken Pasta. 15. Spicy Paleo Chicken and Peaches. 16. Cream Cheese Chicken Enchiladas. 17. Better than Panda Homemade Chicken Orange. 18. Roasted Garlic Chicken Puffs. 19. Cheesy Southwest Chicken Skillet. 21. Mini Chicken Parmesan Meatloaf Cupcakes. 22. Chicken and Cream Cheese Taquitos. 24. Chicken Bacon Alfredo Pizza. 25. Slow and Easy Barbecued Chicken. 27. Chopped Thai Chicken Salad. 29. Spicy Mushroom Chicken Pot Pie. 30. Chicken Cordon Bleu Eggrolls. 31. Meatball Duet – Beef and Chicken. 34. Cheesy Chicken Ranch Potatoes. 35. Chicken Cordon Bleu Nuggets. 36. Blackened Chicken and Cilantro Lime Quinoa. 37. Santa Fe Baked Chicken. 38. Creamy Chicken Broccoli Pot Pie Pockets. 39. Buttermilk Brined Southern Fried Chicken. 44. French Chicken Broccoli Supreme. 45. Barbecue Chicken Pizza Recipe. Images used in this post which are not watermarked are public domain images from Pixabay, MorgueFile or Public Domain.net. See my list of photo sharing sites here. 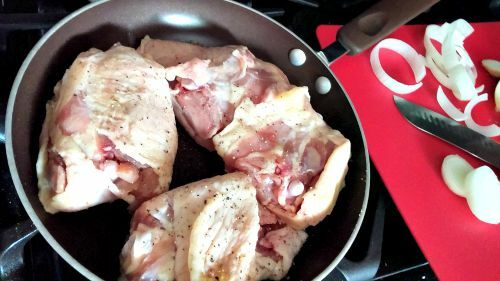 Do you have some other tips for cooking chicken? I would love to hear them in the comments below.